Bill Morrison‘s films often combine rare archival material set to contemporary music. His work was recently honored with a mid-career retrospective at the Museum of Modern Art, NY, from October 2014 – March 2015. Morrison is a Guggenheim fellow and has received the Alpert Award for the Arts, an NEA Creativity Grant, Creative Capital, and a fellowship from the Foundation for Contemporary Arts. His theatrical projection design has been recognized with two Bessie awards and an Obie Award. 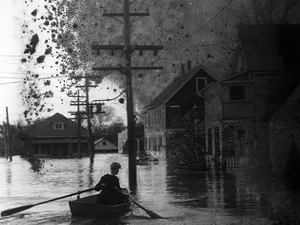 “The Great Flood” (78 min, 2013), a collaboration with guitarist/composer Bill Frisell, won the Smithsonian Ingenuity Award of 2014 for historical scholarship. “Decasia” (67 min, 2002), a collaboration with the composer Michael Gordon, was selected to the US Library of Congress’ 2013 National Film Registry. “Spark of Being” (68 min, 2010) a collaboration with trumpeter/composer Dave Douglas, won the Los Angeles Film Critics Award for Best Independent Film of 2011. Morrison has collaborated with some of the most influential composers and performers of our time, including John Adams, Maya Beiser, Gavin Bryars, Dave Douglas, Richard Einhorn, Erik Friedlander, Bill Frisell, Philip Glass, Michael Gordon, Michael Harrison, Ted Hearne, Vijay Iyer, Jóhann Jóhannsson, Kronos Quartet, David Lang, David T. Little, Michael Montes, Steve Reich, Todd Reynolds, Aleksandra Vrebalov, and Julia Wolfe, among many others. His work is distributed by Icarus Films in North America, and the BFI in the UK.